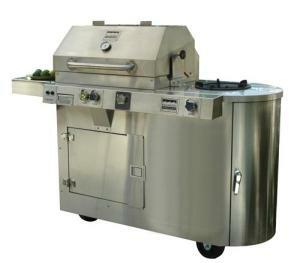 A restaurant quality grill on wheels, the Kalamazoo 450GS Propane Grill offers rugged durability and the power and control that will give even the beginning chef a running start towards success. Specially designed burners divide the spacious 432-square-inch cooking grid into two independently controlled heating zones with 50K BTUs of clean flame beneath. Features you'd pay extra to add to other grills are standard on the 450GS. Kalamazoo's approach to burner design is the result of collaboration with fine chefs from all over the world -- the unique bowtie shape spreads flame and heat evenly beneath the cooking grid and provides a large radiating surface for a more constant temperature. That's not the only unique internal feature: the interior has a wide funnel shape that channels waste fat and char into a large, easily removed container at the bottom. No more uncontrollable shallow drip pans to deal with here. A built-in rotissierie cradle is part of the deal, ready to roll with its own 11K BTU infrared burner. Even the side burner is stepped up a notch -- with 32K BTUs, it has the power to run a large wok instead of just a pot of coffee. Every major part of this fine-looking machine is heavy gauge stainless steel, from the formed steel frame to the polished cabinet and even the control knobs. Kalamazoo guarantees all major components (including the "Dragon" bowtie burners) for life, and adds a one-year warranty on minor features such as ignition and thermometer. The missing feature I'd like to see as standard is an option for wood smoke, but an amazingly well-designed smoker is available as an accessory.